Stick Welding, also referred to as Shielded Metal Arc Welding (SMAW) or covered electrode welding, is one of the most popular types of welding. It’s suitable for indoor or outdoor welding, can be used on any type of metal, and is also one of the simplest types of welding, making it among the easiest to master – no wonder it’s so popular! Stick welding is a manual arc welding process that uses a consumable, you guessed it, “stick” electrode to lay the weld and create the weld pool. The consumable electrode is covered with a flux, which melts as an electric current forms an arc between the electrode and the metal pieces. The flux gives off both gaseous vapors and liquid slag, which both shield the weld from atmospheric contaminants. This eliminates the need for a shielding gas. Like other forms of flux welding, stick welding leaves that slag on the bead, which must be stripped off once the weld is finished. But, since there is no need for a separate shielding gas, stick welding can be used outside, which makes post-weld clean up worth it. 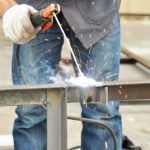 It’s easy to see why stick welding has always been and remains so popular among welders. It’s extremely versatile and simple. Can be used on all types of metals and alloys. Electrode provides its own flux, eliminating the need for shielding gas. Arc stability can be a challenge. The flux, arc blow, and/or environment may cause excessive spatter. Requires more operator skill to provide a good weld. 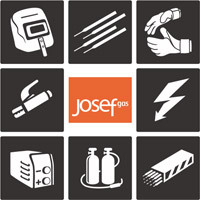 Visit Josef Gas online or in person at 201 Basaltic Road in Concord, Ontario for all of your stick welding supplies. We carry machines, electrodes, wires, gases, and all of the necessary equipment welders need!